It’s the day after Easter and your fridge is cram packed full of hard boiled eggs leftover from the kids decorating and hiding them. What do you do? 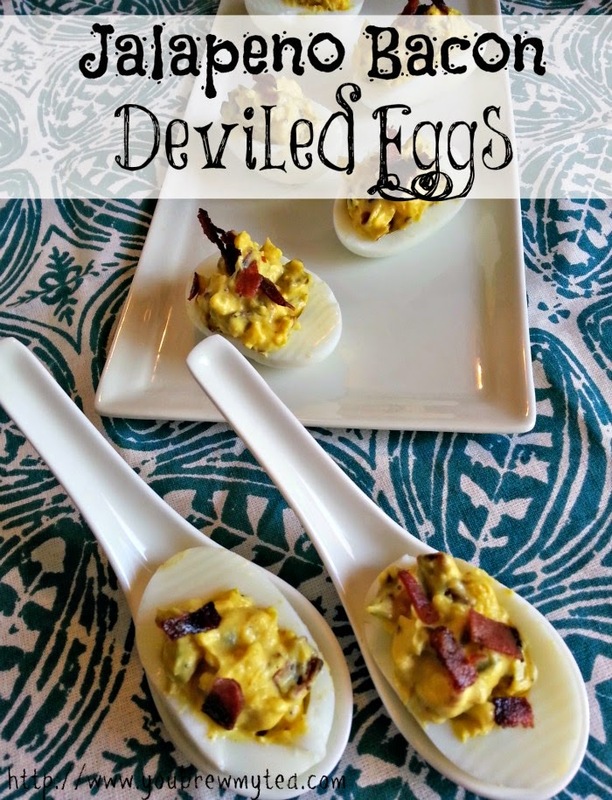 You make these yummy Jalapeño Bacon Deviled Eggs of course! These are a great twist on a classic dish with a bit of a kick that will please everyone at your table. In small skillet cook bacon until crispy. Remove from pan and drain on paper towels. Chop into small pieces to be added to egg mixture later. Add garlic and jalapeño to bacon grease in skillet. Cook on medium heat for 3-4 minutes or until pepper is softened and garlic slightly browned. Remove from skillet and place in small bowl. Pat excess grease from veggies. Slice hard boiled eggs in half scooping yolk into bowl with veggies. Add mayonnaise, mustard and salt and pepper to egg and veggie and mix until well blended. Mix in bacon reserving a few pieces to sprinkle on top for garnish. Store in air tight container in refrigerator until served. Not only do they have the traditional deviled egg flavor you expect but they have an added kick of spice with the jalapeno. Cooking the jalapeño until softened will help keep it from being as hot yet retain it’s full flavor profile in the mixture. They are great for a high protein snack, a side to your lunch or even a great easy and tasty breakfast on the go.